Wood - which represents strength, solidity and warmth - is the traditional material for 5th Wedding Anniversary Gifts . It's a tradition to give a wooden gift, wood being both natural and everlasting. To celebrate five years of married life, how about a truly unique and personal 5th wedding anniversary gift, a Welsh love SPoon! Through the worldwide web, we can now offer everyone unique and traditional fifth anniversary gifts to celebrate the 5th anniversary. 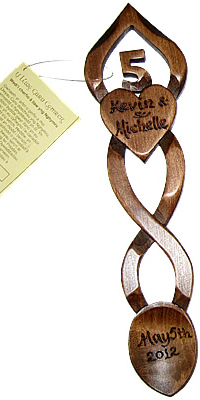 There are four hand-carved Welsh Lovespoons specifically to celebrate the 5th Wedding Anniversray. All can be engraved, free of charge, with your names and date of the Anniversary. Please view the spoons below.